If you can't decide on a decorating scheme for a nursery, these colourful stripes will add a lot of visual interest and you can choose your own colour combination. These stackable toy boxes are great for a kid's bedroom or playroom and when not in use they can be stacked neatly on top of each other. 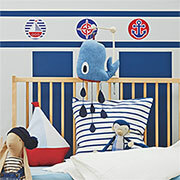 If you are looking for ideas to decorate a nursery or toddler bedroom, this sailor-inspired theme might be just the thing. 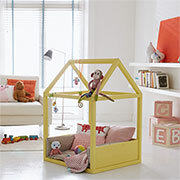 This colourful baby playhouse is great for keeping little ones occupied while you catch up on housework or office work. 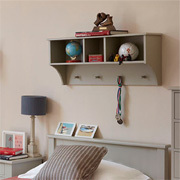 This pine interlocking shelf unit is ideal for storage in a child's bedroom or in a den or family room. This mother of two young boys wanted a shared bedroom that offered smart, affordable storage solutions and space to play. Dollhouse Bedroom Furniture on Special! What little girl wouldn't love her own Dollhouse Bed and Dollhouse Bookcase, and Design-A-Bed have a special offer to order for delivery for Christmas. In a small nursery this wall mounted baby changing station takes up very little space and it has plenty of room for baby accessories. 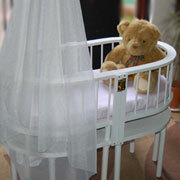 The Kiddie Company stocks everything you could need to make your baby’s room absolutely perfect. All it takes is a couple of clicks and everything your heart desires will be delivered straight to your door. Here's an easy children's bed you can make in a day - in fact you can make two beds in a day! Made using PAR pine and then painted, these basic beds are easy enough to make. Transform a little boy's bedroom with an easy DIY pegboard headboard. A friend recently asked me to make a kiddies table and stool set for her little daughter, after she had seen something locally that was way out of her price range. I was surprised at how easy - and affordable - it was to make. The compact design for the nightstand or bedside table makes it perfect for next to a day bed, or in a small bedroom with limited floor space. 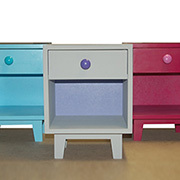 Just the perfect size for a toddler's bedroom, you can make a Mini Mees mini bedside cabinet and paint it in your choice of Rust-Oleum 2X colour, or use Rust-Oleum Chalked Ultra Matte Paint. Here's a nifty - and easy - way to add clouds to a kids' bedroom in more ways than one - for fun! As the grow, young children need to experience, and you'll want to encourage a love for reading from an early age. When you are decorating the nursery for your new arrival, you'll want to use eco-friendly, non-toxic and organic materials in the room. When you want to decorate a gender neutral nursery, or a child's bedroom with a more modern look, grey is definitely the colour to choose! 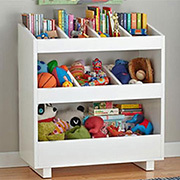 Make your own storage cubbies for essential storage in a child's bedroom or playroom. Here are a few tips from Prominent Paints that will help make decorating and planning your new nursery even better. 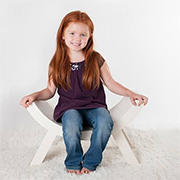 False promises, delayed delivery and shocking quality - when buying children's furniture, do your research before and only buy from an established and reputable company. 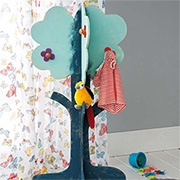 Children's bedrooms tend to look at though they have been hit by a hurricane and keeping them organised is not easy. Here are some quick and easy ways to keep a child's bedroom organised. Use laminated pine shelving and pine planks to make a child's single bed or a couple of storage shelves and cubbies. 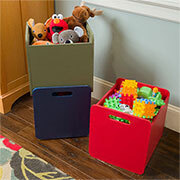 This versatile toy box is fun to make and fun to use. 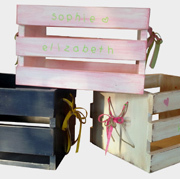 We show you how to make two different toy boxes - using stain or paint. 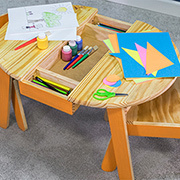 This child-sized play and craft table will inspire creativity. Featuring work and storage space and chairs that are just the right size. Use a ready-made top and ad a few angles and gentle curves for style. In a small home where space is at a premium you sometimes need to make a plan. 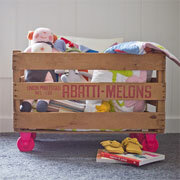 This reclaimed wood bed was designed for young twins... to big for their cot and needing their own bed. 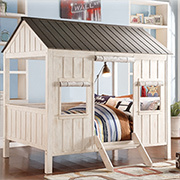 What little boy or girl wouldn't want their very own cabin or playhouse bed. Made from pine and SupaWood, you can buy or make your very own cabin or playhouse bed. 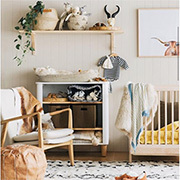 Whether it's weeks or months until your new addition is due to make an appearance, you will want the nursery to be prepared for their arrival. 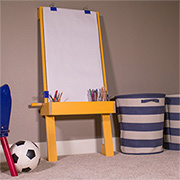 Let your child express their creativity with this easy easel. The easel sits against a wall and has a handy tray for art supplies. Use our star template and Prominent Paints Sheen in your choice of colour to create a magical star nursery for your little one. 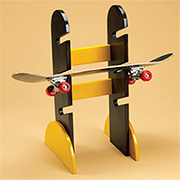 Make this skateboard rack for your kids, or it's a great gift idea. We sprayed outs with Rust-Oleum 2X spray paint. 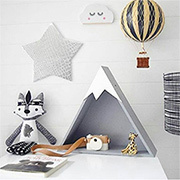 The idea for this triangular shelf is from Kmart (Australia) and a company that sells the add-on pieces to turn the shelf into a designer piece. We show you how to make the shelf - and finish it off. Forget chevron... go with zigzags! If you still haven't built up enough energy to paint walls with a chevron pattern - hurray! 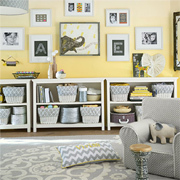 Chevron is out and zigzags are a fun way to use paint to add fun detail to walls, especially in a child's bedroom. This project uses small blocks of SupaWood to create personalised wall art for a child's bedroom or nursery. 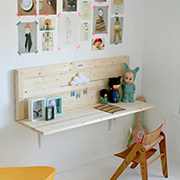 When I saw this nursery furniture designed by Dutch design firm Teehee, I realised the potential of making this as a DIY project using birch-veneered plywood. While you may not be able to buy this unique design here, there's no reason you can't make your own. Here's how to make a dollhouse bookcase for a little girl's bedroom and that offers plenty of storage space. It's made using 16mm SupaWood that you can buy - and have cut to size - at your local Builders Warehouse. More often than not, a growing family means a larger, more expensive home. Interior Designers Peppermint Bliss took on the challenge to create two cleverly planned children's bedrooms that allow plenty of space for a growing family. 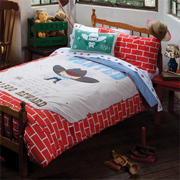 As your child grows, so does his or her ideas for how they want their bedroom to look. The boy's bedroom shown here was designed to be a space that would transition a little boy into a young adult. It can be difficult to decorate for a teenager, but with clever planning you can design a room that incorporates all the elements a teenager needs for a calm and practical bedroom. 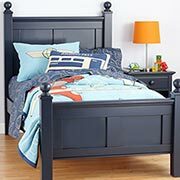 If you are decorating a child's bedroom, Design-A-Bed are offering a 20% discount on select beds, and special offers on large quantity orders. There are many ways to make picture frames, and we look at 3 ways, using three different methods to make a set of picture frames for a nursery, or for any room in the home. After making the kiddies table and chairs as a project for Home-Dzine, a friend of mine asked me to make one for her daughter's bedroom. She also requested I upholster the seats. 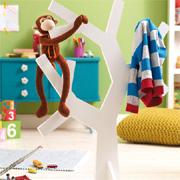 Use 12mm or 16mm Plywood or SupaWood and colourful paints to make a coat tree to help keep children's bedrooms neat and tidy. This family business uses materials that are child-friendly, with not a piece of plastic in sight. In their little workshop they create ecological, non-toxic furniture and products for kids rooms that incorporate fantasy and adventure. 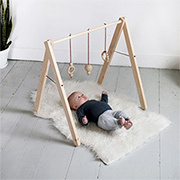 This simple wooden play mobile won't cost much to make and you can add colourful or interesting shapes, homemade toys or eye-catching items to keep your little one occupied. If you are looking for inspiration for decorating your little girl's bedroom, we put together a collection of 18 dreamy bedroom designs. Use these ideas to aid you in decorating the perfect room. 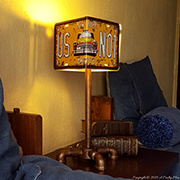 This vintage-style bedside lamp is made using mock licence plates, PVC fittings and galvanised pipe and accessories. What a wonderful finishing touch for a boy's bedroom. This hutch and desk might look complicated, but it's actually an easy project if you break it down and assemble in sections. 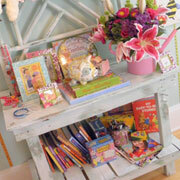 Children love colour, whether it's bold, primary colours, or more muted pastel shades. We put together some ideas for decorating a children's bedroom using both bold and pastel colours. 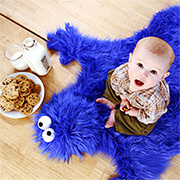 Use super-soft plush fabric to make everyone's favourite cookie eating monster. Using plush faux-fur fabric and some other supplies, I was able to make this rug in under an hour. This soft rug is great for kids, and the cookie pillows really make it complete. 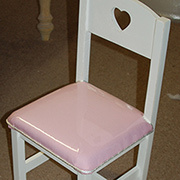 Use PAR pine and MDF to make these kiddies chairs with storage tray. You can paint them any colour using Rust-Oleum 2X spray paint or use wood stain or tinted varnish. 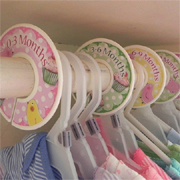 A piece of pine or MDF, some brightly coloured plastic cups and colourful paper or fabric and you can easily make this easy coat hanger for a child's bedroom. 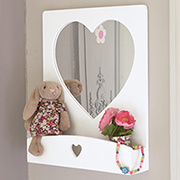 This adorable heart-shaped mirror with storage shelf is easy enough to make and you can use Rust-Oleum 2X spray paint to finish in your choice of colour. 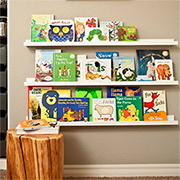 Making up a set of book ledges is a quick and easy project that allows you to create a stunning library wall or reading nook in a child's bedroom. This coastal style furniture is easy enough to make using PAR pine or reclaimed wood, and is painted in coastal theme colours. 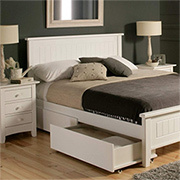 If you need extra storage in a bedroom, making underbed storage drawers with caster wheels allows you to pack away bed linen, winter blankets, clothes, shoes, or use as storage for children's toys to free up space and contain clutter in a bedroom. For large families, or where space isn't available, sharing a bedroom is a necessity. This shared bedroom shows that you can incorporate spacesaving design - even in a small room. 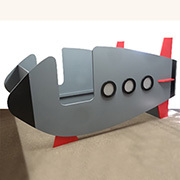 This rocket / spaceship bed was made for a little boy who loves anything to do with space and I thought it might be nice to show you how easy it was to make the bed. 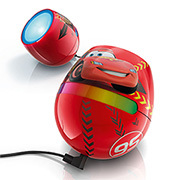 Designed for kids of all ages, LivingColors Micro lights are packed with the latest LED lamp technology and produces up to 64 different light colours. 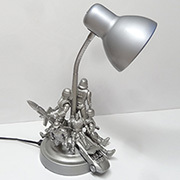 Lighten up your child’s imagination with a Table Light / Desk Light for your kids bedroom. 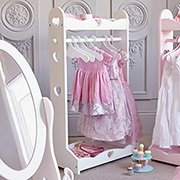 This adorable clothing rail with heart cut outs would add a finishing touch to any little girl's bedroom and is the perfect accessory if you daughter loves to play dress-up. 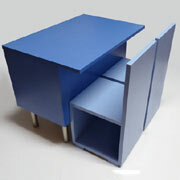 This modular cube desk is perfect for a child's bedroom - boy or girl. Stack up the storage cubes, fit doors or shelves and finish off with a cube seal with extra storage. This trendy desk is made using 16mm MDF from your local Builders and painted with a Bosch PFS spray gun. The modern design blends will most bedroom styles and it offers storage drawers for school supplies or stationery. 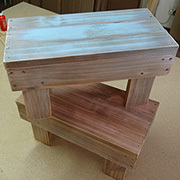 These baby step stools are fun to make and small children can use then as seats or as a step stool. Here's an easy way to make colourful storage cubes using some PAR pine, a few tools and some Rust-Oleum 2X spray paint. 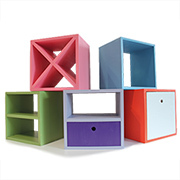 You can stack up the storage cubes to make a colourful display that would look great in a child's bedroom or playroom. In a small bedroom this child's bed with its bookshelf or storage headboard takes up no additional space and offers a place to store books and small toys. Plywood decor and furniture is perfect for decorating children's bedrooms or for making furniture. Marine plywood is a strong board product available at timber merchants around the country and costs a fraction of what it would cost to buy hardwoods. This marine plywood desk is super easy to make and can be done in a day. 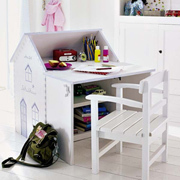 Dress up a child's bedroom with a compact and practical desk. 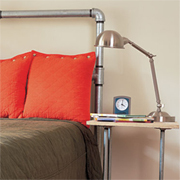 Mount recycled paint cans spray painted in bold Rust-Oleum spray paint colours for storage or display. 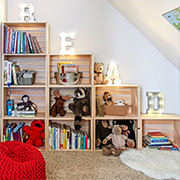 Our MDF bookshelf offers plenty of storage for books and toys for a child's bedroom. You will only need half a sheet of 16mm MDF to make the bookshelf and have board left over to make a second bookcase, or for another project. Amy transformed her sons bedroom in bold, bright colours, using bought and found items on the cheap and putting her decorating talents to use to add striped walls and funky accessories. Many parents tend to overlook the fact that as children grow up, so does the need for a bedroom that is better suited to a young adult. Quite a few years ago we featured an article on the moon crib. 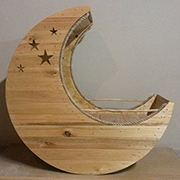 This fairytale moon-shaped crib for a baby was doing it's rounds across the Internet and we gave it a go. Quite a few readers have made the moon crib and we would like to share the most recently project submission. 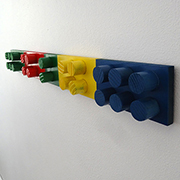 This Lego block coat hanger is a colourful and fun way to encourage young children to hang up their clothes. It's made using a piece of pine and a large pine dowel that is glued together and sprayed with Rust-Oleum 2X Ultra Cover in bold primary colours. Writing the article the other day about creating a study area for a child's bedroom, and the many enquiries I receive about desks, got me to thinking about making a desk for a young child, or a teenager for that matter. From a young age, even before starting primary school, children need a place to sit and draw, and later on to study. If you start with study from a young age children find it much easier to make it a habit to sit and learn, whether at home or at school. These curved chairs look great as feature pieces or when used in a child's bedroom. But I think their contemporary design allows them to be used anywhere, in any setting. Kids love colour and decorating a bedroom for a young child can be a fun way to incorporate bold and primary colours in ways other than painting walls. Planning a nursery for one can be a real challenge. But when it comes to designing a nursery for twins, that challenge just got doubled! Bedrooms for young children not only need to offer a comfortable place to sleep, but also to play, as well as accommodate the growing needs of a school-going child that needs to study. 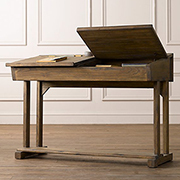 I discovered this simple desk design on Maison Du Monde, a French furniture manufacturer. It consists of two open shelf units and a top and sells for around R2500. 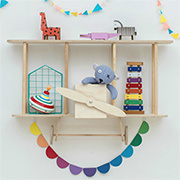 This simple wall shelf can be mounted above a bed or desk to provide storage for toys, books and accessories, or decor. This practical storage bench also serves as a toy box. 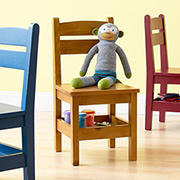 The seat lifts up to provide a place to store toys out of sight and keep any child's bedroom uncluttered. Kids love to play with lego and you invariably end up with pieces of lego all over the house. 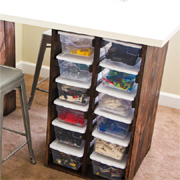 Why not make a simple organiser that can be used to store lego and small toys but still allow the kids to have easy access - and an easy way to tidy up after they have finished. 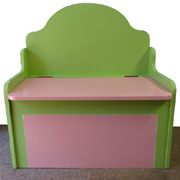 This pretty house-shaped desk is ideal for any little girl's bedroom. The design takes up very little space but offer plenty of storage. 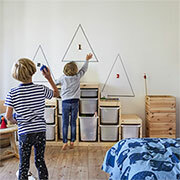 Small Design, a company based in Denmark, ,have developed a range of children's furniture that is functional and colourful. A popular theme that is popping up everywhere, is to decorate a nursery in gender-neutral colours with a lamb or sheep theme. 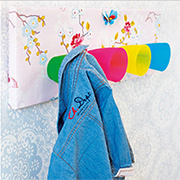 Make a tree-shaped coat rack or hanger out of 12mm MDF and paint this in your choice of colour for a fun coat rack or hanger for a child's bedroom. Arrange with your local Builders Warehouse to cut half a sheet down to size, or make more than one and give them as gifts. I saw this desk on pinterest and immediately thought it would be a great project for a DIY Divas workshop. The Divas completed the desk today and I though it might be nice to share the project with you. 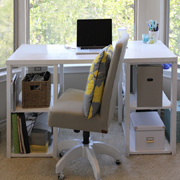 Make this desk for a home office or for a child's bedroom. Play tents are popping up everywhere - in the garden, on the patio, and definitely in a children's bedroom. The holidays may have come and gone, and have no doubt added to the already strained storage capacity for your child's bedroom. Shelves are overloaded, toy boxes filled to the brim and you can't seem to find storage space for new items. For an affordable bedroom makeover for a little girl there are plenty of tips and tricks that you can use to decorate a trendy and colourful bedroom. 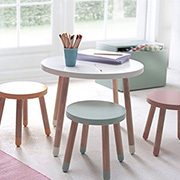 This kiddies desk or storage table and chairs is actually quite simple to make and looks stunning once painted with Rust-Oleum in shades of blue. 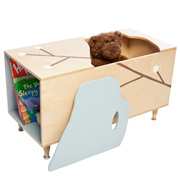 The desk lid lifts up and offers a nice storage space for toys or craft and painting supplies. 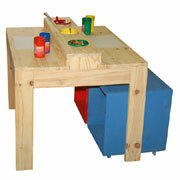 Our kiddies craft table is perfect for a playroom, or make it smaller to fit into a bedroom. We based the design for this table on our garden table, but modified the top to allow for paint pots to hold crayons, pens, pencils, paintbrushes, and even water for painting. If you daughter is a little ballerina, she will love these tutu bedroom ideas using tulle. See how to use tulle to make a tutu no-sew nightfrill, or make a tutu table with tulle. 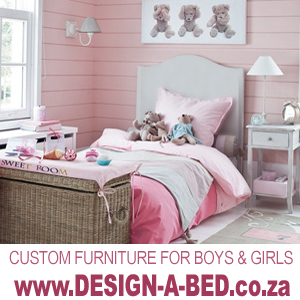 There are some absolutely gorgeous designs out there for children's furniture, but since most manufacturers don't ship to South Africa, it's nice to know that local designer Design-A-Bedcan manufacture children's bedroom furniture - and beds - to order. 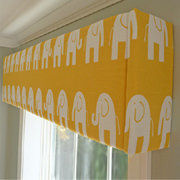 If you are looking for ideas to decorate a nursery, adding an upholstered or fabric covered pelmet is definitely one idea you might want to consider, especially if you are fitting blinds or a plain window treatment. 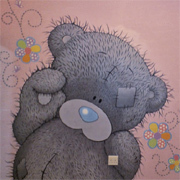 This adorable tatty teddy mural adorns the wall of a special little girl's bedroom. Painting a mural itself is not difficult - it all depends on the design you choose. Tatty teddy took 4 days to complete, but the result what oh so worth it. Applying wall vinyl designs to a wall is one way to add interest to a plain wall, or in this case, an empty corner in a room. 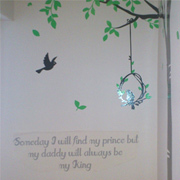 In this little girl's bedroom, a custom design was printed onto vinyl and then stuck onto the wall. 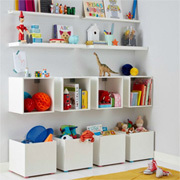 Children always need a place to store their small toys, craft suppliers and even small items of clothing, such as socks. This fabric pocket organiser is quick and easy to make, and you can use fabric scraps, offcuts or recycle old clothes to make it really affordable. 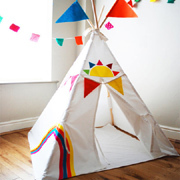 Decorating a kiddies bedroom can be expensive when it comes to adding fun accessories, that's why we have put together a selection of DIY decor crafts and projects that you can do in a day (or on a weekend) to add colour and interest to any child's bedroom. Browse the Internet looking for plywood furniture for children's bedrooms and you will come across plenty of designers, many of whom started out as a home-based business and have gone on to become major furniture producing enterprises. This book caddy retail at around R1200 if you had to buy them ready made. Make your own and it will cost you nothing if you use any offcuts lying around, or R600 for a sheet of 16mm PG Bison MDF and you can then make 3 or 4 units from one sheet. Loft beds, when well constructed, and designed with safety in mind, definitely have a place in a children's bedroom. In a small bedroom, or shared bedroom, a loft bed allows for sleeping above and play below, allowing the smallest bedroom to be a fun place for any youngster. We have previously featured a project that shows how to make your own wine crates, and you can make a few minor modifications to the design to create the adorable storage crates for a nursery or children's bedroom. 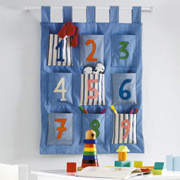 Decorating a nursery or children's bedroom can be fun... if you have a dash of creative ability. But if you don't you will love this project. This beautiful nursery is decorated in shades of pale blue and pink, with splashes of white and magenta polka dots. Browse the Internet and you will find plenty of designer ideas for furniture using reclaimed timber. In fact, furniture made using reclaimed wood has become an option for many looking for furniture for a home. 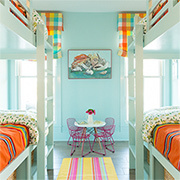 Designing and decorating a boys bedroom can be just as much fun as decorating a bedroom for girls. The only difference is that furniture should be sturdy enough to take the knocks that invariably come with having boys! I often receive enquiries on some of the bedding featured in bedroom articles. The good news is that you can now buy directly from international stores and have duvets and bedding shipped to South Africa. 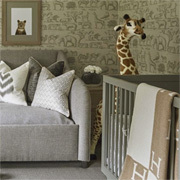 If you are looking for ideas to decorate a nursery, here are just a few stunning nursery designs that I came across. 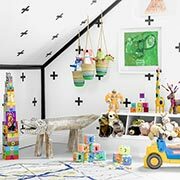 Why these nursery designs in particular? 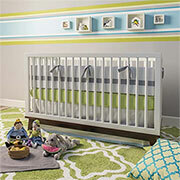 The colours are modern and fresh, yet easy to replicate in your own nursery design. 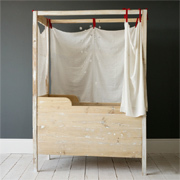 But before you restore an old cot or crib, there are a few steps to follow to ensure the project runs smoothly and the painted or varnish cot or crib is properly prepared for a lasting finish. With property values at a premium and rates for rental properties going through the roof, you sometimes have to settle for a home that is smaller than what you originally planned for, especially if you have small children. As they grow children require ever-increasing storage space. A place to hang clothes, to store toys, storage for books, and eventually a space to do their homework. And today's older kids need space for video games, PC or laptop, and perhaps even their own TV or hi-fi. While once again searching around for ideas using PVC pipe, I stumbled across a great idea for using PVC pipes (in this case scaffolding) to make a headboard. 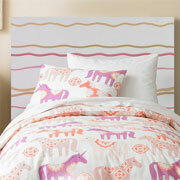 This is a great idea for a children's headboard. We have seen damask, geometric and chevron stencils, and now it appears that houndstooth stencils are becoming popular for decorating a feature wall. In this project a houndstooth stencil was applied to a feature wall in a little boy's bedroom - with stunning results. 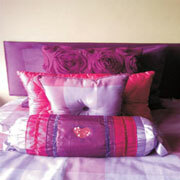 Little girls love pink... and in this home a pink bedroom and bathroom are just what every little girl longs for. The bedroom is dressed in shades of palest pink with just a hint of soft green, while the bathroom is a bolder pink with lime green accents. This is such an simple project that makes it easier to find clothes and is a great idea since we don't have these closet dividers available locally. Although this cabinet is perfect as a bedside table for a child's bedroom, it can also be used as a bathroom storage cabinet or even a side table for a lounge. You can finish it with various techniques to fit in with your own personal style and add as little or as much detail as you want. I recently found myself on ethan allen and, while this range of furniture is not available locally , there's no reason why you can't use this inspiration to make your own bedroom furniture for a girl or boy. Today we had our DIY Divas Workshop and made this child's art and craft table and chair. We cut out all the curved pieces and sanded where necessary and the entire project (excluding painting) took 2 hours from start to finish. I have just finished making a desk for a little girl that can also be purposed into a study desk for a child or adult, or a dressing table. 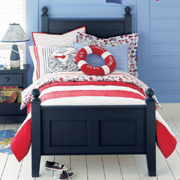 We can't do ideas for a girl's bedroom without looking at ideas for a little boy as well. Even little guys like to have some style in their room... a theme or colourful setting where they can spend time playing with cars, action figures or building with lego. 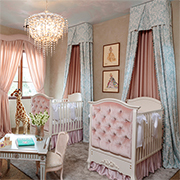 With two grown boys I never really had the chance to experience the joy of decorating a bedroom for a little girl, but I still love browsing through beautiful images of bedrooms that would be perfect for a little lady. If there is one thing the Danes are good at, it's thinking outside the box. 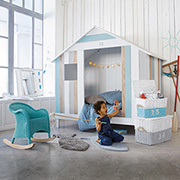 Kids furniture company Kidsfactory have launched a range of treehouse beds that combine play and sleep. At Design-A-Bed they receive lots of enquiries to manufacture furniture found on the Internet, and particularly on Pinterest. This heart bed is one of those. The client fell in love with this bed set and wanted the exact same design for her young daughter. This cot attaches to the side of the bed, but still has enough space for baby, with baby literally within arms reach, so parent and child get all the benefits of sleeping together and helping you to bond with your baby. 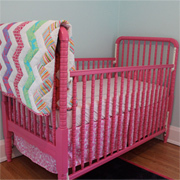 A client asked me to design and make this gorgeous cottage bed for her little girl. At first I was a bit wary of all the colours, but the end result really looked absolutely amazing. Easy DIY magazine recently commissioned me to design a couple of quick and easy headboard projects. I put my thinking cap on for this and one idea that immediately came to mind was to paint a headboard, the second was to apply wallpaper to the headboard. Easy DIY magazine recently commissioned me to design a couple of quick and easy headboard projects for future issues. I put my thinking cap on for this, and one idea that immediately came to mind was to paint a headboard. 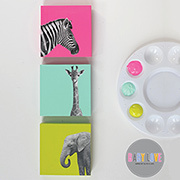 Create your own colourful artwork for a nursery or child's bedroom with some framed canvas and craft paint. 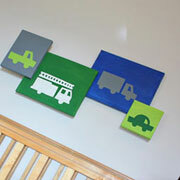 This is a reasonably affordable and simple way to add splashes of colour to a nursery or a toddlers bedroom. Forget about theme rooms, these bedrooms are timeless and traditional. Not for your average tomboy, take a look at some bedrooms designed for a young lady who loves pretty but practical furniture with flourishes and frills. 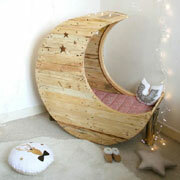 What infant or toddler wouldn't love to sleep in this fairytale moon crib or bed? Designed by Creme Anglaise, the moon crib retails at around R11,000 - a bit pricey for us South Africans, but you could make your own moon crib or bed. That cute, teddy bear wallpaper and pink furniture set was perfect when your child was growing up, but a bedroom makeover is on the cards if your child is turning into a teenager. 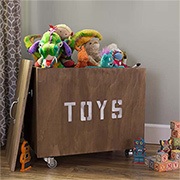 You can use any box to make a portable toy box. All you need are four castor wheels and some Rust-Oleum 2X spray paint and you have a portable toy box that can go anywhere! Designed by Erin Loechner at Design for Minikind. 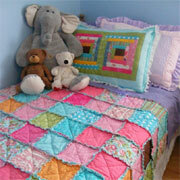 This adorable rag quilt is filled with wonderful colour and pattern that is perfect for any little girl's bed and you can choose your own fabrics, either from scraps that you already have, or from offcuts in the bargain bin at your local fabric store. Kids are messy... Rearing two active boys and taught me the value of having plenty of storage and teaching my kids how to use it. Storage is essential for a child's bedroom, but it needs to be practical and pretty if kids are going to use it. 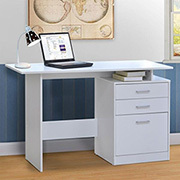 Take a look at some of these desks available at PB Teen (a division of Pottery Barn).Once you have seen these designs, you should be inspired enough to rush out and buy a set of power tools to make your own study desk. 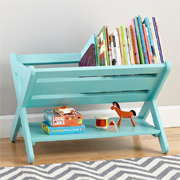 Children need plenty of storage space and this great idea allows you to incorporate storage into design. 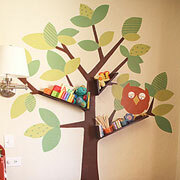 The tree mural is a wonderful way to add fun shelves that children will enjoy. The crib easily transforms into two chairs and also features a storage shelf. You can add a canopy over the top simply by hanging from the ceiling. Reader, Candice and her husband, whose 11 year old daughter was away for 2 weeks during the December holidays, decided to surprise her daughter by giving her bedroom a makeover. 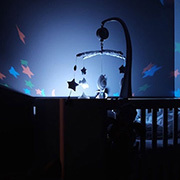 Whether you've been taking steps toward green living or you're a newbie and want to jump start your efforts and reduce your carbon footprint on earth, one area of opportunity is your toddler's room. Having recently stumbled upon new design ideas from ClosetMaid, I thought it would be nice to share some of the stunning ideas they have come up with. They might inspire you to rip out and install a new closet. Five essential tips that can guide you in designing a room for your child. When you have kids, you want to make sure that their bedroom is their safe haven.